"Just keep swimming! Just keep swimming!" Where'd she go! Disney has unveiled the first official teaser poster for Pixar's Finding Dory, the sequel to Finding Nemo, starring once again Dory the blue tang and her clownfish pals Marlin and Nemo. The voice cast includes Ellen DeGeneres, Albert Brooks, Idris Elba, Dominic West, Diane Keaton, Ty Burrell and others. 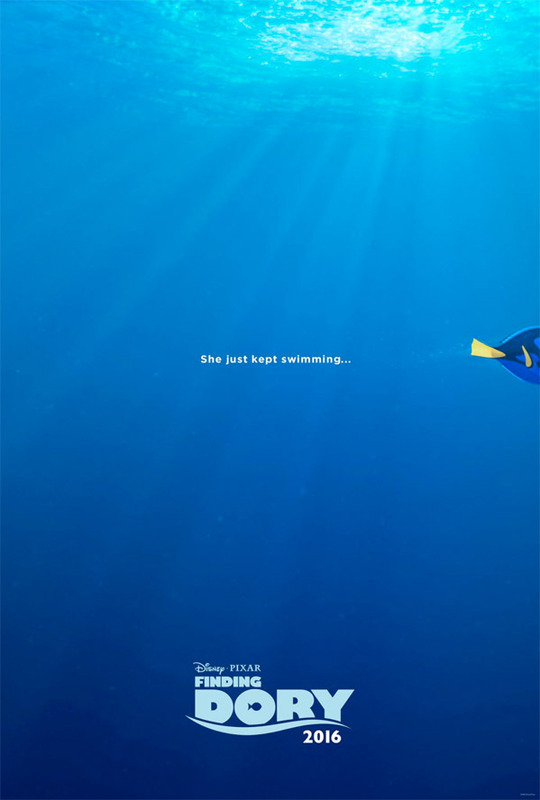 The teaser poster is very simple featuring nothing but Dory escaping out of frame, and the new tagline for the movie. The tagline is very simple as well, and almost too on the nose for my liking, but this is just a tease so there will be plenty more to see. For now, take a look. Nice. But the tag is misleading, Dory remembers now so the tag imo makes it seem like she forgot. Ah, but does she remember now? I think something traumatic will happen in the beginning that causes a relapse in her disorder. Perhaps you're right. I just loved her character arc from Finding Nemo and really would be disappointed if they "damage" her for sequel's plot sake. Did it ever say her memory issue was fixed, I remembered the theme that she remembers better when she's with Marlin, but did it ever say her issue was downright fixed or just improving? when she's with Marlin she remembers. I always assumed she was improving. *Possible spoilers for this particular film* wasn't she a "lab-fish"? Y'know, kind-of like a "lab-rat", except, well, you know… a fish? I am just happen this is happening with Stanton at the helm.